Hurray! We are back in school and back to making music! 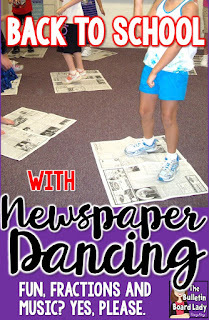 This week my students learned how to do the newspaper dance. 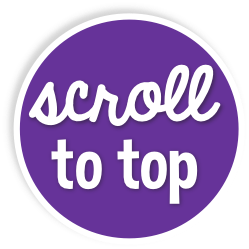 We started with a section of the paper, unfolding it and laying it flat. This was our "dance floor". Students then could dance in their space. Before we started, each group decided what they considered to be "dancing". Most groups said that to be dancing you had to move your arms and legs in some fashion. Now, as fun as that was...it was just getting started. Next, we stepped off the newspaper and folded it in half and stepped on again. After a while, students had to move in very creative ways to stay on the newspaper. We had a great time defining "dance", practing making the fraction 1/2 and movin' and groovin' to some great tunes. With older students we created math sentences like "We are standing in 1/8th of the space that we started on." 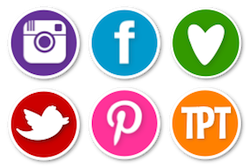 This collection includes cards with pictures and cards with word prompts to use with your students. Pass out your scarves, ribbons or streamers and start the music. Then hold up the cards and let students choose how to interpret them. 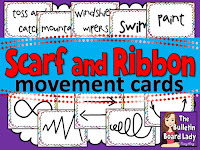 I also love to use other sets of movement cards that don't always have one correct way of being interpreted. 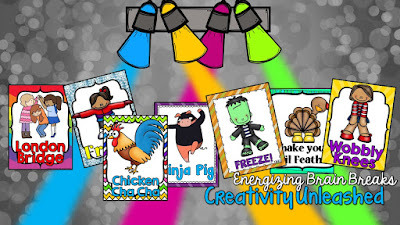 I have several sets of Freeze Dance and Creative Movement cards that you might be interested in.